Many facility managers have different mops and cleaning trolleys for different spaces. Thanks to the ServoClean Graphite (SCG) 1700 Series, the amount of equipment you need has been greatly reduced. The product, which is manufactured by ServoClean Graphite Professional, has been described as one of the most comprehensive trolley series in the market. 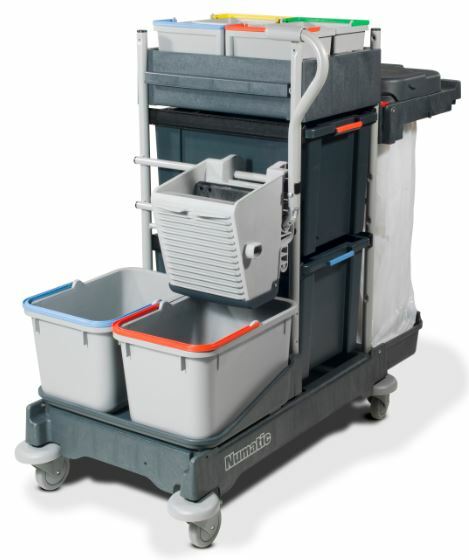 It consists of six base trolleys, each one offering its own storage configurations. Whether you need an open and accessible trolley or one that is closed and secure, the model can accommodate any configuration that is needed. The 1700 series comes with seven available mopping systems and accessories, which can be accommodated by all configurations. There is also an option door design or lockable tablet lid option. The trolley series has a 120 litre waste capacity and a structofoam construction. It also comes with storage drawers and an optional fixed floor sign. Selecting the right mopping system for the right cleaning task and environment is easy thanks to the SCG1700 Senes Mopping Kits. Being able to select the mopping kit and accessories you need within seconds, will greatly improve the efficiency and effectiveness of any cleaning regime. If your clients are ready for a one-stop trolley unit and mopping kit that will enable them to create a custom mopping system for any environment, then contact Numatic to learn more about the ServoClean Graphite (SCG) 1700 Series.